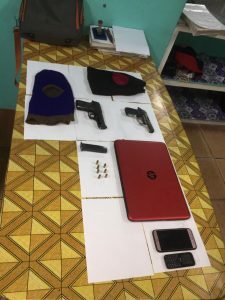 Prompt action by Police ranks stationed in ‘D’ West Demerara Division following a robbery under arms committed on three persons at Parika, East Bank Denerara Wednesday night,has resulted in the apprehension of the perpetrators and the stolen articles recovered, the Guyana Police Force said. Investigators said one of the suspects was found in possession of two unlicensed handguns and seven live rounds. The victims, one being a female bar proprietor, and two patrons were pounced upon about 10 PM by three males two of whom were armed, who exited a motor car. 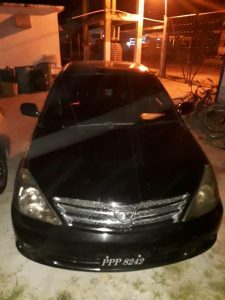 The suspects relieved the victims of a laptop,three phones and a sum of cash ,discharged a round in the air and escaped in the said vehicle. The vehicle was intercepted at Cornelia Ida on the West Coast of Demerara with two of the suspects and based on further information received ,a public transportation vehicle was intercepted at the western end of the Demerara Harbour Bridge and the other suspect was arrested with the firearms ,ammunition,two toques,and the stolen articles; another person suspected to be accomplice,was also arrested in the said vehicle. The suspects hail from Diamond,Kuru Kururu, Albouystown,and Best Village, West Coast Demerara.